All our furniture is designed and manufactured in our ‘Wembley Factory’, London. We stock, cut and assemble all of our furniture within our premises. Hence we have a full control over production line and delivery time. We also hold large UK stock of colour glass in our warehouse for our sliding door units. We also have a glass polishing machine, so we can prepare glass tops for bedside cabinets, glass shelves for dressing units, unique style drawer fronts for jewellery drawers. Why would you make a decision about an important purchase like fitted wardrobes or your fitted kitchen without physically seeing it and feeling the quality of the products and fittings. This is why we strongly recommend you to visit our newly refurbished showroom where you will be able to see and feel the quality for yourself. 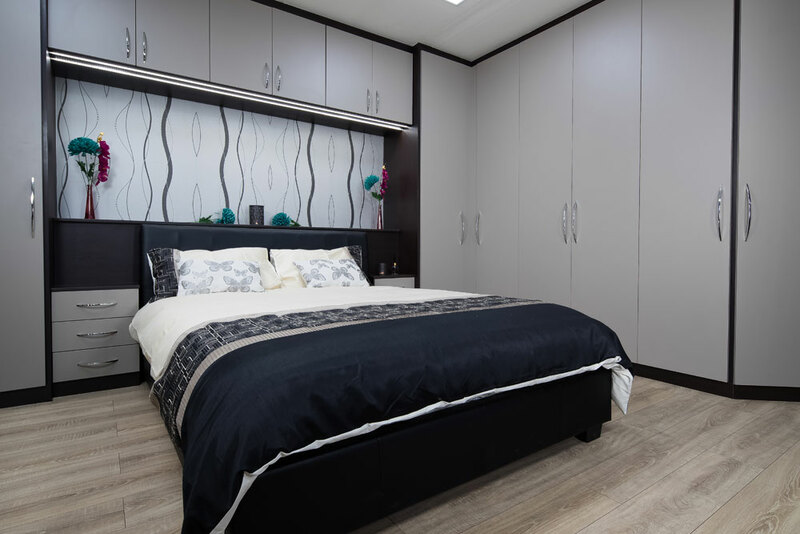 We have displayed various types of wardrobes and kitchens including Traditional shaker style, contemporary high gloss units, spacious walk-in wardrobes, modern offices, stylish TV units and fully fitted bedroom set-up with integrated headboards and bedsides. Keeping in mind the size and layouts of London homes, we have displayed all sorts of internal arrangements which can be adjusted to fit any space. We have displayed all sorts of lights available as well as our extensive range of handles available in different finishes and sizes. We have also arranged a unique area where we exhibit our full Egger Board range as well as glass samples. You can pick up any sample, have a closer look and feel, and find your ideal combination and matches. We always have our designers available to have a quick chat, or give advice or even design your wardrobes there and then. We are confident that we have displayed designs and colours you will not see anywhere else.